Volunteer employees visited three charities serving the population of children with medical and psychological conditions. Hundreds of Banco Santander Puerto Rico employees participated in recent volunteer activities focused on the health and well-being of children with physical and mental health conditions as well as cancer patients. The initiatives were carried out as part of the celebration of the 10th anniversary of “Semana Somos Santander” week, in which employees of all the countries where Grupo Santander Group does business carry out efforts to benefit communities in different areas. Volunteer employees visited three charities serving the population of children with medical and psychological conditions — the Go-GoGo Foundation in Ponce, the Children’s Hospital in Guaynabo and the Pediatric Medical Center Hospital in San Juan. They donated time by entertaining the children, presented them with hand-made motivational postcards, and donated food, basic necessities and toys. On the other hand, more than 150 employees participated in the “Da Vida” walk, for the benefit of patients at the Dr. Isaac González Martínez Oncology Hospital. The bank’s volunteer staff joined comedian Raymond Arrieta on the route of the fifth day of the walk, which went from Morovis to Vega Baja. In total, employees raised $58,000 for the Cancer Hospital. Employee participation in the “Da Vida”walk is in addition to the “Santander Solidario” initiatives, through which a unit of Banco Santander leads a monthly voluntary effort. This time, it was led by the Commercial Network team and its director, Luz Molina, bank officials confirmed. 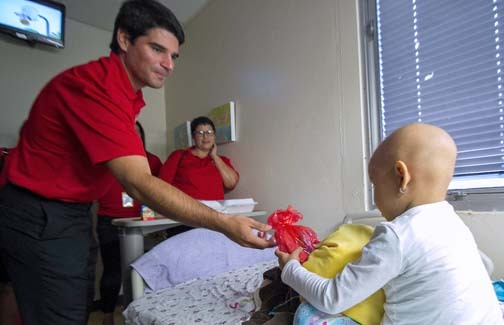 Hey Buddy!, I found this information for you: "Santander employees volunteer for cancer patients". Here is the website link: https://newsismybusiness.com/santander-employees-volunteer/. Thank you.